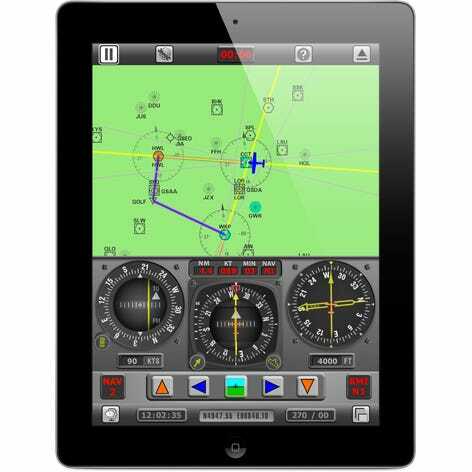 Now you can learn how to use VOR, DME and ADF right from your iPad and iPhone! 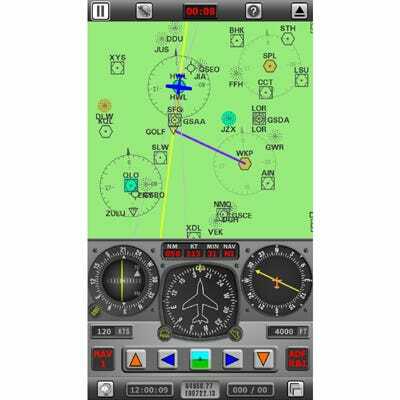 The Radio Navigation Simulator app shows a simulated instrument panel with a directional gyro and user-selectable CDI, RMI, HSI, ADF and DME. Drag your airplane around the map, turn the OBS knob and see the results. 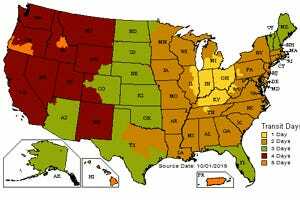 Change the map location, change navaid frequencies and more--it’s easy and educational. 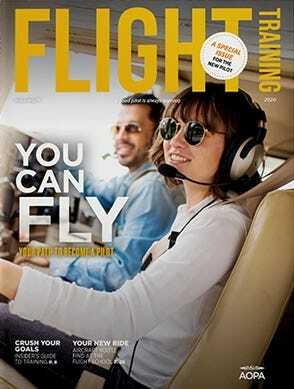 Perfect for student pilots, flight instructors and pilots preparing for a flight review. 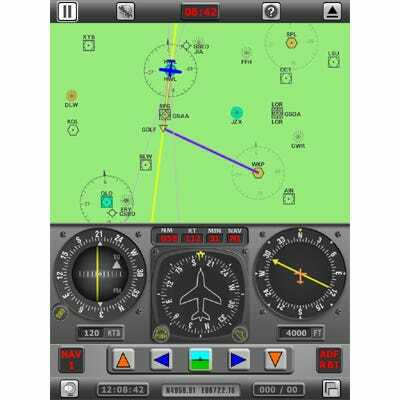 Radio Navigation Simulator enables pilots and students to practice, understand and become proficient in the use and management of VOR, DME and ADF/RMI instruments, all displayed with an HSI or Directional Gyro on a realistic Flight Panel, with other Flight Panel functionality. RNS is the perfect mobile tool for instructors to demonstrate radio navigation techniques, and for students to consolidate and self test. Experienced pilots will find RNS valuable to prepare for an instrument rating or proficiency test. Radio Navigation Simulator (RNS) is flown in a Synthetic Flight Environment, with real world derived aeronautical data, using latitude and longitude mapping, where realistic flight training can take place. • Flight Environment mapped in Latitude and Longitude. • RNS operates with a Synthetic Aeronautical Database. • The Radio Navigation Facilites area is approx 300 x 200 nm. • Unrestricted Lat & Long flight outside of Facilities area. • Area Navigation Facilities are VOR, VOR-DME and NDB. 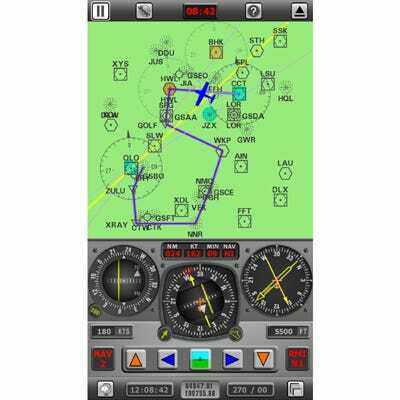 • Scaleable Chart with Facilities, Idents, and Aircraft symbols. • Full Chart management with VOR Radials and Planned Routes. 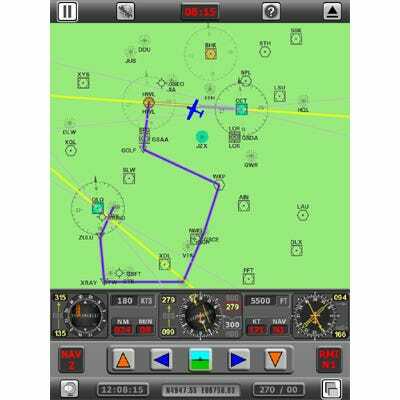 • Aircraft Track Trail can be displayed, or suppressed. • Flight Panel and Navigation Chart simultaneously displayed. • HSI, VOR, DME, ADF (RMI or RBI), RMI (dual needle) and Directional Gyro . • Manageable Radios for ADF, NAV1 and NAV2 (with DME). • Airspeed range 60 to 600 knots. • Altitude management and display. 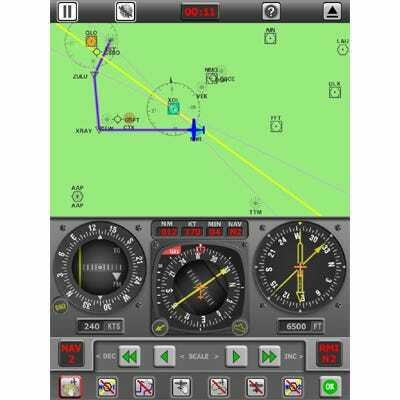 • Flight profile in Real or Compressed Time. • Wind velocity, 0 to 99 kts, from any direction, steady or variable. • Dead Reckoning Navigation Capability. • Intuitive Multi-Gesture Operated User Interface. • Touch Button Flying Controls. 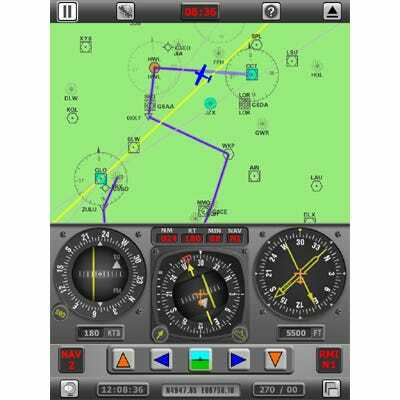 • PopUp Toolbars & Annunciators to manage Flight Panel facilities. • PopUp Toolbars and Icons to manage Chart facilities. • Detailed "Getting Started" Help, available within the app. 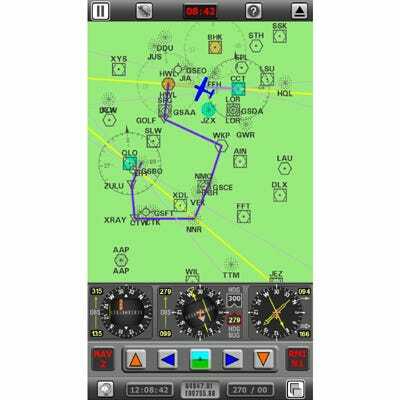 • Printable Radio Navigation exercises with charts. • Support for iPhone 5, with a 40% increased Chart area. • HSI - Horizontal Situation Indicator. • RMI - Dual Needle. • Five flight panel Instrument configuration options. • Panel layouts optimised for iPhone, iPad & iPad mini. • Instrument case outer edge 45° markers for Directional Gyro, HSI , ADF, RMI. • Improved multi page menu system. • Support for iOS 6. Does this require a touch screen? BEST ANSWER: Yes, requires an Apple device. Is there a PC version of this app (program) available? BEST ANSWER: I would recommend a google search. We do not have a pc version of this program.